Few things are more annoying for cyclists than changing a flat, especially on a back tire. Non-pneumatic tires that have proven workable for off-roading and other vehicle prototypes are now getting tested for bicycles. Their design incorporates a resin inner wheel with a typical spoke form and a polymer outer wheel with a different type of spoke formation that distributes weight and pressure across even more spoke-like supports. With a unique structure of spokes stretching along the inner sides of the tires supporting the weight of the vehicle, there is no need to periodically refill the tires with air, meaning that the tires require less maintenance. At the same time the worry of punctures is eliminated. 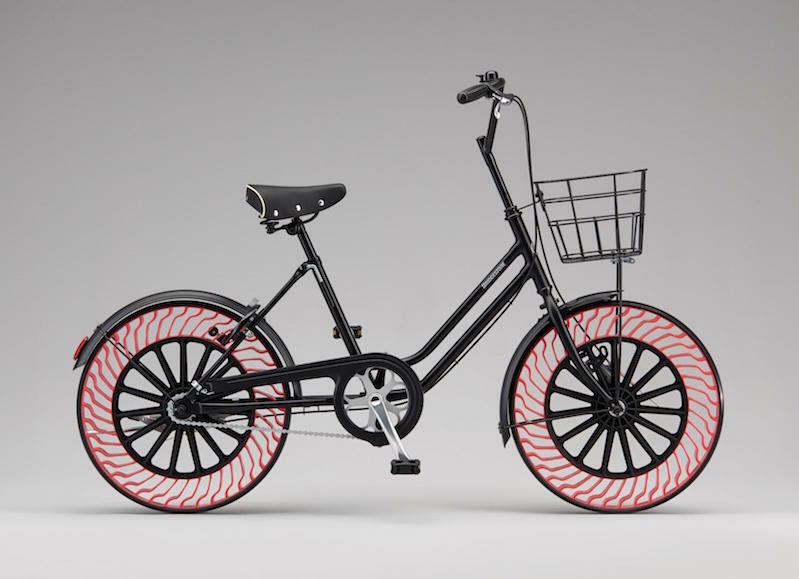 In addition, the spoke structure is made from thermoplastic resin*1 and, along with the rubber in the tread portion, the materials used in the tires are recyclable, contributing to the efficient use of resources. Further, by pursuing extremely low rolling resistance and contributing to reductions in CO2 emissions through use of proprietary technologies, Bridgestone believes it is possible to achieve even higher levels of environmental friendliness and safety. Bridgestone is pursuing this technological development with the aim of achieving a "cradle to cradle" process that proactively maximizes the cyclical use of resources from worn tires into new tires and the use of recyclable resources. Here's the same concept on an earlier personal vehicle with the resin spokes and rubber tread. Can there be a mile-high skyscraper?